Exercise Before Knitting Gifts? Yes, go out for a little jog before committing to that queen-sized afghan for your cousin’s child’s girlfriend’s dorm room! 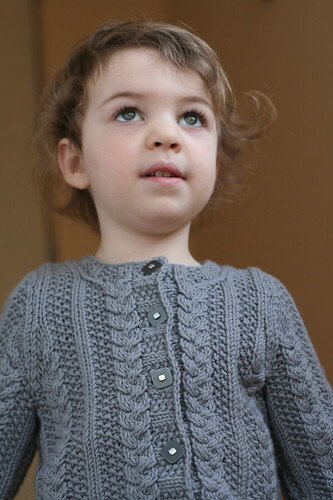 Or, use the coupon code EXERCISEBEFOREKNITTINGGIFTS in my Ravelry pattern shop to buy 2 patterns and receive the 3rd free! The promotion will end 12/31/2010. Otherwise, check out the Holiday and Winter issues of Interweave Knits for some new Exercise Before Knitting designs. These two colorwork patterns for Interweave Knits Holiday were inspired by that old Latvian mitten book I found last year. Slanted Peerie Mittens feature a more unusual stranded pattern, one that moves diagonally across the fabric. The design reminded me of ribbons and wrapping paper, a good motif for the holidays. 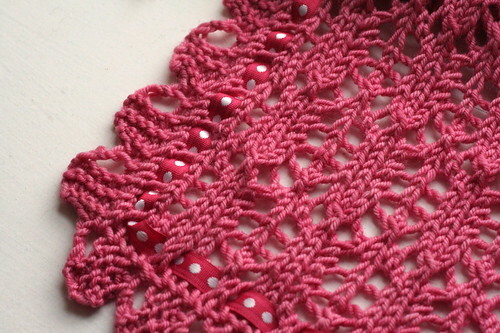 Although these have three different colors of yarn, the little bits of red are actually duplicate stitched on once the knitting is completed. Parallax Hat came about as I went looking for an easy stranded pattern to work at worsted weight into a pointy little elf-like cap. I am mad for the spiral top on hats in general, and I think it looks even better in colorwork. Consequently, I made the two-color spiral the heart of the design, then worked out the rest from there. 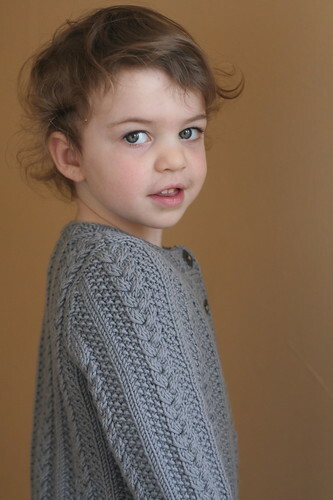 Tuckernuck Cardigan, a baby/child (3 mos – 5 yrs) pattern appearing in Interweave Knits Winter 2010, comes with a bit of history. 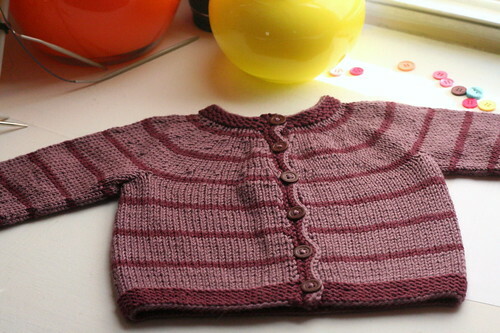 While we impatiently awaited the arrival of baby #2 this time last fall, I thought I would pass the time in part by knitting Beatrix a big sister sweater with lots of lovely cables. Intending to self-publish the finished product, I sketched out the design, set up a spreadsheet, planned a list of sizes, and then powered through the knitting. Baby Odysseus interrupted my seaming, so this sat untouched for a few months. I finished it just as I was packing away our winter woolens. 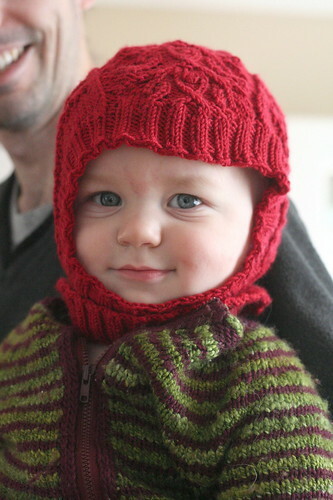 When someone from Interweave asked if I had any children’s patterns for Winter 2010, I sent off my sketches. Normally, I dread selecting buttons because I have an incredible knack for making extremely poor button choices. One of my coping strategies is to ask other shoppers in the store what they think of my button choice. 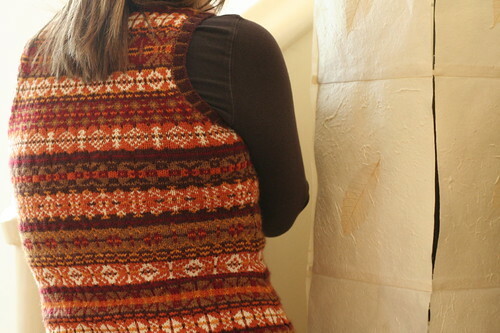 Did you know most knitters and sewers love choosing buttons? They do. AND they’re usually quite good at it, don’t you think? These particular buttons pleased me very much. 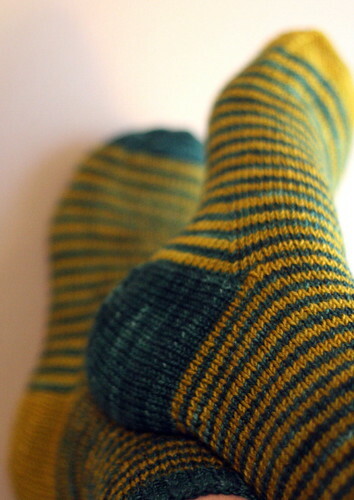 They look great with the gray yarn, and don’t detract from the cables at all. I realize many people do not want to think about baby or kids’ patterns, but I maintain the set-in sleeve is worth the (small) trouble. 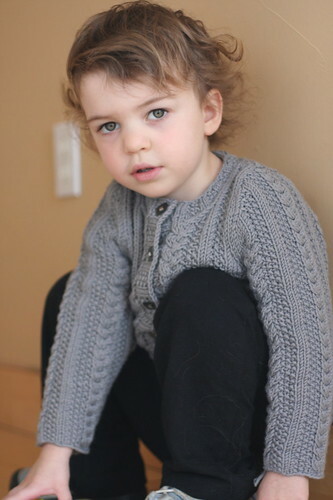 Well fitting knits look great on children, don’t you think? 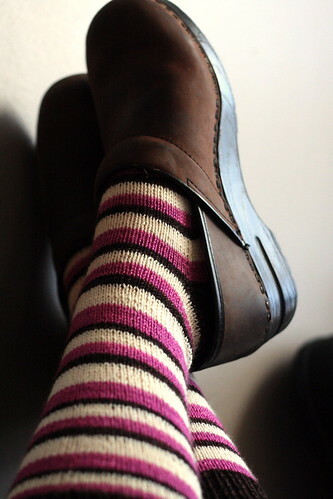 Stay tuned for some more gift ideas, namely a pair of Latvian-inspired mittens from Twist Collective!